Skate Cape May 2011: Day 8: 8/17 - Northfield to Sea Isle City! Good afternoon everybody! 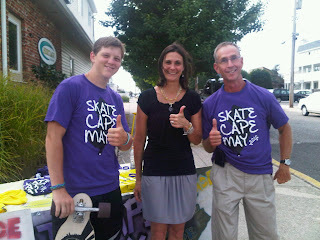 It is August 17th on this tuesday night and it is the night before Skate Cape May officially ends! You may be wondering (or not wondering) as to the meaning behind the picture above, but I'll tell you more later in this post! For now, I'll split the post again into the skate and the lemonade stand. Today was an absolute awful day for me, but a fine one for Danny! His bike got another flat, and even though I said previously that he'd be biking for the next day(s), he really couldn't anymore. So halfway riding through Pleasantville he switched out to the longboard and pushed the rest of the way! I personally only got about 16 or 17 miles out of our 25 for the day, mainly because we stopped to eat at a Wawa's and I actually got very very sick. Like the kind of sick where I needed to throw up, and also did (multiple times unfortunately). It escalated to a point where at the end of the 16th or 17th mile, I was literally too sick to continue. I had to be driven to Sea Isle while Danny completed the Northfield to Sea Isle leg, where I kind of helped set up but mostly laid down and tried to rest. I was sick for a large portion of the day unfortunately, and as of now I still feel a bit sick to my stomach. While I was resting and the lemonade stand continued, Alex's mom, Liz Scott, dropped by! It was certainly an honor to meet her, even though I only got to say hi for a moment before returning to the car. And so, when she arrived at the stand, photographs ensued, and Doug Frohock from a nearby church came by and got his picture with both Danny and Liz! And that's what you're seeing above! Later on in my fun fun day I felt better, and joined both Brad and Jay from Original Skateboards, Liz Scott, my mom, Danny's dad, and Danny of course to an early dinner, which was certainly a fun time! And afterwards, we all pretty much returned to the cars after a few discussions here and there, and as Liz Scott and Brad and Jay departed, we made our way to DiGenni's Centennial House to stay for the night. Danny went to the beach, which I'm sure was fun. I took a nap! Tomorrow, August 18th, be sure to check us out at the Rita's of Cape May, at 707 Beach Avenue, Cape May, NJ. We'll probably arrive sometime around two or three and have our stand until about 6:30! Come on by, it'll totally be a party! We are only one short day away from the end of Skate Cape May! See you all in Cape May tomorrrow!